This tab defines a number of special purpose tasks for notes. This can be opened directly via the shortcut [Cmd]+3. Prototype (list). This holds a list of prototypes defined for the current document. The current selection's prototype is pre-selected; default is 'none'. A prototype cannot use itself, but can use another prototype. so if a prototype is selected, it will be greyed out in the pop-up list. 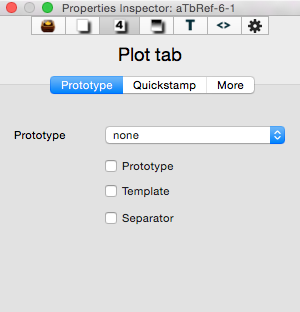 Prototype (tick-box). Ticking this makes the selected note into a prototype. Template. Ticking this defines the note as being used to store code for an export template. Separator. Ticking this defines the note as a separator and thus is visible only in Outline view.